Cinque Terre Ristorante and Pizzeria at Sunshine Beach offers authentic Italian cuisine with meals inspired by Italy’s famous Cinque Terre. Ahhh……Cinque Terre! Have you been there? This string of centuries-old seaside villages on the rugged Italian Riviera coastline is famous for its sweeping sea vistas and hiking trails across a dramatic Ligurian coastline. 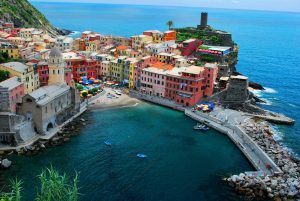 Colorful houses and vineyards cling to steep terraces, harbors are filled with fishing boats and trattorias turn out seafood specialties along with the region’s famous sauce, pesto. Now, Noosa has its own little slice of this Italian paradise with the introduction of the Cinque Terre Ristorante and Pizzeria in Sunshine Beach. 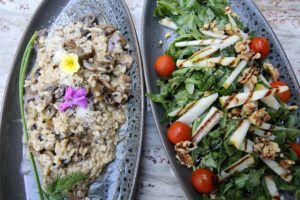 Steeped in Italian authenticity, this family run restaurant is quickly making its mark as a local’s favourite. 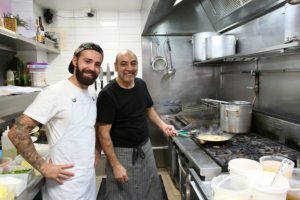 With genuine Italian flavours, quality local ingredients served by a friendly, close-knit Italian family – how can you go wrong? Like Ligurian cuisine, the menu has a strong theme of seafood…..
Signature primi piatti like Spaghetti in Barchetta and Penne Mare e Monti make generous use of the Sunshine Coast’s local seafoods. Secondi piatti like Gamberoni al Cognac, Calamari alla Griglia and Filletto di Red Snapper continue the fresh seafood theme. Meat-lovers and vegetarians are also well catered for with lamb, chicken, steak, risotto, pizza and gnocchi dishes. A creative breakfast menu and selection of anti-pastas and deserts are also popular. With decades of experience, Salvatore Zedde leads the team with his wife Ines and his daughter Sara and her husband Antonio Masella. The family arrived from Sydney five months ago to find a suitable Noosa location – there was no other destination option, according to Antonio. “My family had been to Noosa on holidays and I knew this was the only choice for the vision we had for Cinque Terre,” says Antonio. “We wanted a beachside option and what we found available at Sunshine Beach was perfect. “People who come here say it’s just like being in Italy – so we know we are doing something right,” says Antonio. Cinque Terre Restaurant and Pizzeria is BYO and is situated at 56 Duke Street Sunshine Beach and is open every day from 7.30am to 9.30pm.